Khenchen Padma Vajra (Khenpo Pema Dorje) was one of the foremost students of Patrul Rinpoche. He ordained as a monk at an early age and was known to be able to master complicated texts without needing to study. 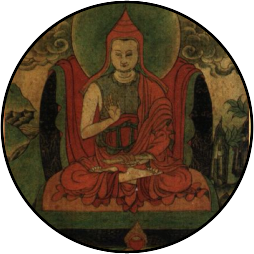 He requested teachings and transmissions from some of the greatest teachers of the Longchen Nyingtik lineage including Jigme Gylawe Nyugu, Kunzang Zhenpen, and Zhenpen Thaye. As a result of mastering all the scriptural traditions of Sutra and Tantra, he became and great scholar and accomplished yogi. Over a long period of time, he also received transmissions and empowerments of both the Nyingma Kama and the Sutra tradition from the excellent qualities of Jamyang Khyentse Wangpo and others. He wrote and taught many commentaries clarifying wrong views in the Old Translation School. Having grasped the essential meaning of the scriptures of Longchen Rabjam and Jigme Lingpa, he spread the teaches far and wide, thereby gathering many students around him.